A succulent steak grilled on the BBQ is a beautiful thing. 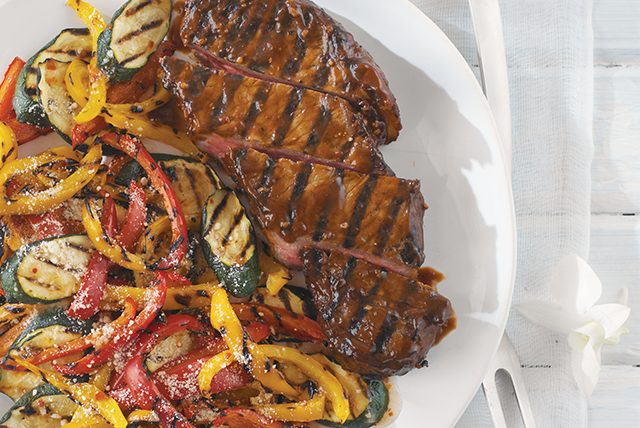 There are lots of ways to flavour a great cut of steak, but we've got a recipe that rises above the rest. Pour dressing over steak in shallow dish; turn steak over to evenly coat both sides. Refrigerate 30 min. to marinate. Heat barbecue to medium heat. Remove steak from marinade. Discard marinade. Grill steak 13 to 16 min. or to medium doneness (160°F), turning and brushing occasionally with barbecue sauce. Place steak in large freezer-weight resealable plastic bag. Add dressing; seal bag. Turn bag over several times to evenly coat steak with dressing. Freeze up to 2 months. Thaw in refrigerator, then cook as desired. The meat marinates as it thaws. Prepare using Kraft Balsamic Vinaigrette Dressing.